This coin depicts the Indonesian National Hero Pangeran Diponegoro (Dipanegara). Diponegoro was born during the Dutch occupation on November 11, 1785 in Yogyakarta to Sultan Hamengkubuwono III, the ruler of Yogyakarta. His mother a concubine of the Sultans. Under Dutch rule the local leaders like his father had lost many important rights such as the ability to lease land and were, instead, paid by the Dutch to keep the peace. This added to the indignities of general long term colonial rule spurred the young prince to openly rebel. Diponegoro believed he was chosen by divine power to oppose the Dutch and many believed him to be the fabled Ratu Adil, or the the Just King, a messianic figure in Javanese folklore who will establish universal peace and justice. For 5 years, and with great success, Diponegoro fought the Dutch using guerilla warfare, attacking food supplies, ambushing Dutch camps, and surprise attacks which inflicted large losses of food and soldiers on the colonial power. With each new attack and each win his popularity grew and more people from every class joined the revolt. Indonesia was far too valuable for the Dutch to lose and the tide slowly changed as they invested more money and men to defeating the young prince and his freedom fighters. They built dozens of new heavily armed fortresses which severely hampered Diponegoros ability to move and maneuver as well as placing a large bounty on his head which forced him to defend, not only against the Dutch attempts to kill him, but traitors within his own ranks eager to cash in. In 1830 the Dutch sent an invitation to Diponegoro to negotiate a resolution in which he accepted but instead of peace negotiations he found that the the invitation was a trick to lure him out and he was captured. Although the Dutch spent more than 20,000,000 Gulden, and lost thousands of their finest soldiers fighting Diponegoro, they did not kill him for his offenses. Thinking his death might cause even greater unrest because of his great popularity, they instead sent him to Manado, in the North Sulawesi provence, to live in exile. 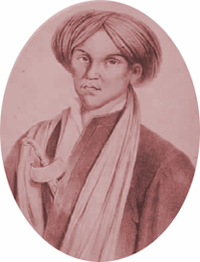 On January 8, 1855, Prince Diponegoro died in exile at Ujung Pandang in South Sulawesi. About Indonesia: Indonesia is a nation that is made up of of 17,508 islands making it the world's largest archipelagic state. Its capital is Jakarta. With a population of over 200 million, it is the world's fourth most populous country with over 300 ethnic groups. Although the Government officially recognizes six religions, namely Islam, Protestantism, Catholicism, Hinduism, Buddhism and Confucianism, Islam is the professed religion of over 86% of the population making the most populous Muslim-majority nation in the world. Indonesia is wealthy in natural resources and has been an important trade destination since early Chinese sailors began to find profit in the spice trade during ancient times. many foreign powers have been drawn to the archipelago by its wealth of natural resources including India, Muslim traders and Europeans who fought for monopolization of the spice trade. Indonesia was colonized by the Dutch for over three centuries and briefly occupied by the Japanese until the nation declared its independence in 1945 under the leadership of Sukarno, the popular leader of the Indonesian Nationalist Party who would become its first president and would remain the nations leader for 22 years. 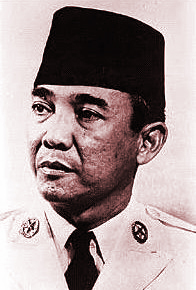 Indonesia suffered from tensions between the ruling military powers and the Communist Party of Indonesia which culminated in a coup which saw the deaths of many prominent military leaders in 1967 and was quickly followed by a counter-coup led by Major General Haji Mohammad Suharto resulting in a violent anti-communist purge in which hundreds of thousands were killed. General Suharto took this opportunity to take the office of president in which he would remain for the next 31 years until 1998 when, facing popular discontent, accusations of corruption, and popular protests, he resigned. Since the retirement of Suharto, Indonesia has slowly under gone a wide range of reforms, not the least of which was its first popularly elected president Susilo Bambang Yudhoyono. Even with the recent democratic and social reforms, Indonesia still suffers from political and economic instability, sporadic social unrest, and terrorism.